Ben Horowitz loves hip-hop, but in an interview with TechCrunch he outlined a deeper vision behind his firm’s $15M investment into Rap Genius. “Knowledge about knowledge over time becomes as important as the knowledge itself”, said Horowitz about the value of the site explaining lyrics, religion and more. Watch Rap Genius’ founders tell me their roadmap for bringing understanding across the web. “Our model is actually the Talmud,” said Horowitz. He believes Rap Genius could expand to make any important text that’s too dense or confusing into something comprehensible, the way the Talmud did for the Torah. That might seem like a leap of faith, considering right now Rap Genius is just an isolated website where users submit text, then annotate it with pop-up footnotes. It’s a huge help with rap lyrics that are chock-full of new slang, heavy metaphor, and obscure references. It’s also got other works like poetry, legal documents, rock songs, and religious texts. Layered on CNN, users could point out bias, conflicting reports, or other articles offering background info. TechCrunch could annotate a startup’s blog post with in-line explanations of products referenced or bad news that’s been glossed over. With its overlaid, in-line pop-ups of images and explanations, Rap Genius is actually creating an alternative to hyperlinks. 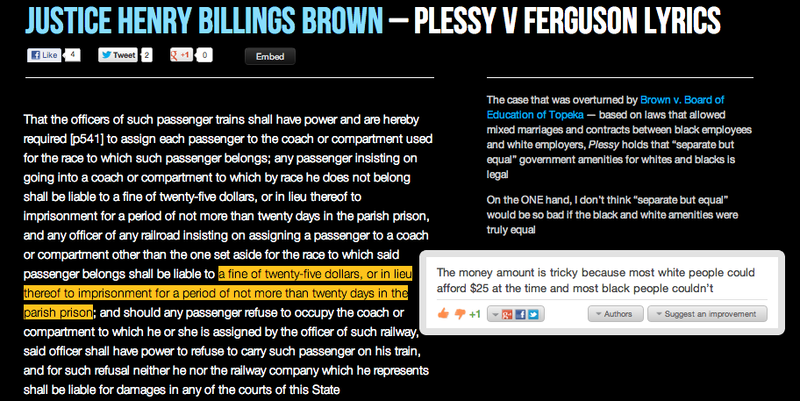 For example, instead of linking to our past coverage of Rap Genius which would require you to read through some redundant info, I could annotate this article with a pop-up highlighting the pertinent nugget of knowledge from that old post — that Rap Genius offers verified accounts allowing authors to provide official explanations of their own work. Rap Genius is immensely powerful when populated in near real-time. 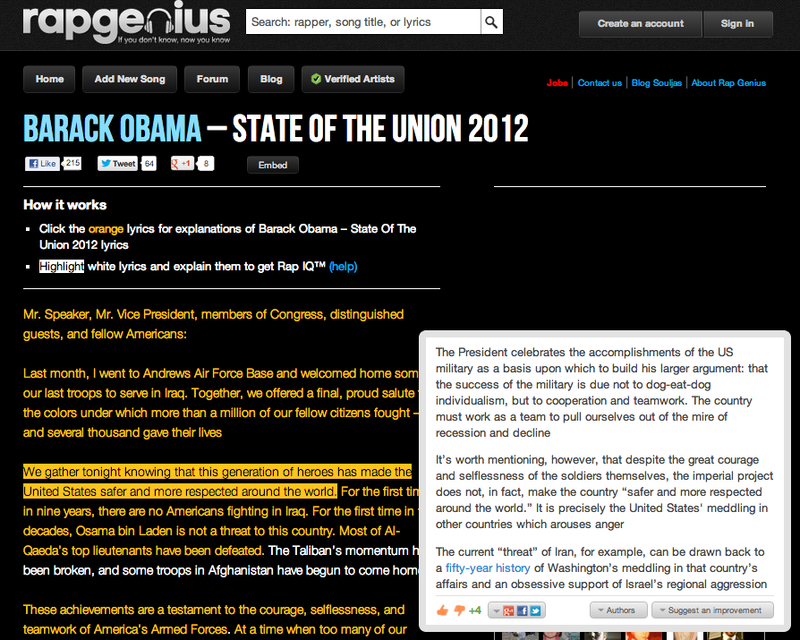 Users uploaded and annotated Barack Obama’s State Of The Union address as soon as it was done, providing a great service to anyone confused and who wanted answers right away. One question for the future of the service is whether it can thrive across content types with a name as specific as Rap Genius. The founders say they already have sections like Stereo IQ for rock music and Poetry Brain for poetry. There are advantages to carrying on the Rap Genius name instead of rebranding as something more neutral, though.